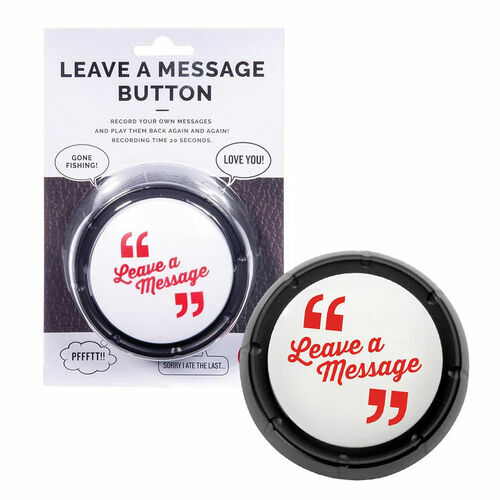 Leave a Message Button | Record your own messages! Share your thoughts with someone special! Leave a funny audio message for your loved one with this ingenious Leave a Message Button! You can record a heart-warming compliment for someone special, or make them laugh with your best dad joke! Let them play it over and over again at the press of a button, before recording over it with your very own witty reply. Record for up to 20 seconds and let someone know where you are or what's on your mind! "Mum, we're out of milk", "Son, I've gone fishing, see you at 5! ", "Don't forget, you make me proud". Made from resistant ABS plastic. Dimensions of button: 9cm x 9cm x 4cm.